When you think of curling up with a good book, your Car Owner’s Manual probably isn’t what you had in mind. Unless you’re a “car person” that little book in your glove box is far more intimidating than entertaining. After all, you know how to turn the key in the ignition and pump the gas. As far as you’re concerned, the rest is your mechanic’s problem. Right? Did you know that something as simple as using the wrong type of fuel could potentially cause you to void your warranty? This is the kind of helpful information found in your owner’s manual. Truth is, your car’s manual is so much more than just “fine print”. It is a wealth of information about preventive maintenance and troubleshooting. Knowing the contents of your manual can save you time, energy, and often a great deal of money. Your owner’s manual is vast resource of knowledge, from basic set-up instructions to troubleshooting. And while it doesn’t cover everything, it does help you decipher the details. Warranty Coverage – knowing the details of your coverage educates your decisions when it comes to your mechanic’s recommendations. While most procedures may be covered, some parts and repairs may actual void your warranty. It pays to know. It is all too easy to ignore routine auto maintenance. But ignorance is not bliss when it comes to your vehicle’s safety. In fact, the longer you wait to deal with small details, the more likely you are to cause big damage. Your owner’s manual can help you do your own inspection. Like a pilot who is required to do a pre-flight check before flying, a regular once-over on your car will help you catch small problems before they become big issues. Tire Pressure – correct tire pressure extends the life of your tires and gives you better gas mileage. Tire Tread – Nobody wants a blowout. Your manual shows how to check that your tires are in good shape. Lights – ensure headlights, tail lights, brake lights, and blinkers are all working properly. Fluids – your manual will show you how to check the levels of your oil, wiper fluid, antifreeze, power steering, coolant, and transmission fluid. Belts – keep an eye out for worn and damaged belts. Again, your manual will offer recommendations for replacing belts in a timely manner. Spark Plugs – compromised spark plugs can prevent your engine from running efficiently. 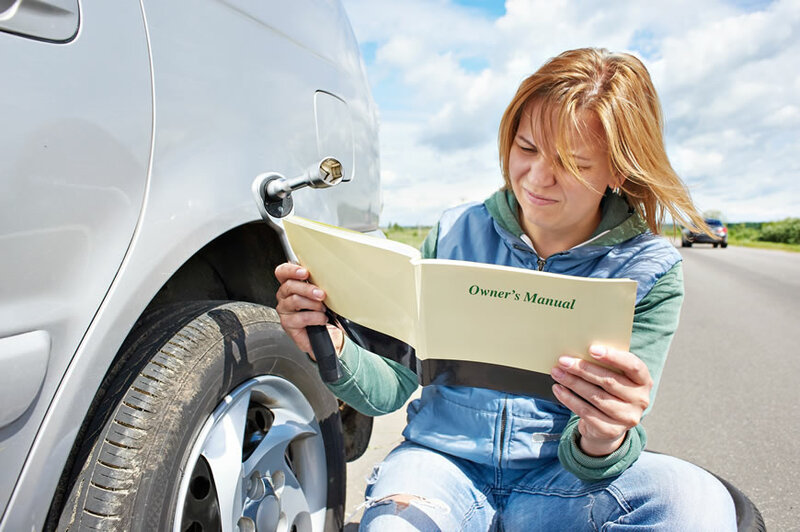 The most common time people pull out the owner’s manual is when the car is experiencing a problem, and rightfully so. At some point we all find ourselves stranded and help may not be readily available. 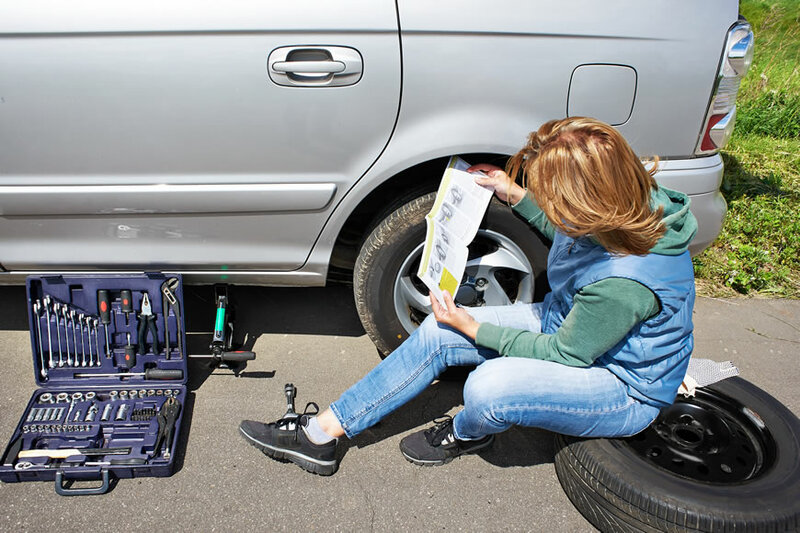 Your manual can help you make sense of the most common emergencies, like dealing with a flat tire or a dead battery. It can also help you understand what may be wrong based on specific warning lights. Now you better understand that your vehicle’s manual is more than just a dust-collector for your glove box. But what if your manual is missing or your need to reference it while the mechanic has your car? One way is to do an online search for your car’s year, make and model. Often you’ll be able to view the manual. Other times you may have to register with the website in order to access the manual. This may even involve typing in the VIN number. Another way to find your owner’s manual online is to check websites like justgivemethedamnmanual.com. Sites like this keep backlogs of manuals and happily share them with car owners. These are just some of the high points of your owner’s manual, but they are important ones you should know. Taking a few minutes to learn what your manual has to offer will help you be less intimidated when maintenance needs or problems arise and give you peace of mind when you hit the road.